PHOENIX, Ariz., (October 9, 2018) – On Tuesday, October 9th, at approximately 9:00 AM, the Mesa Police Department arrested Lance Wills, 42 of Gilbert, on a warrant at a Mesa residence with the assistance of the City of Mesa Development and Services Department. 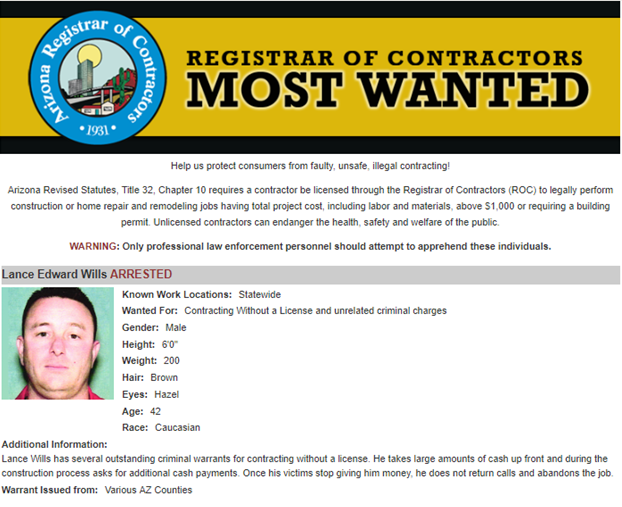 Wills is listed as one of the ROC’s Most Wanted Unlicensed Entities. The warrant was for failure to pay the court ordered restitution after Wills dba NSD 1 LLC pled guilty to Contracting Without a License, a Class 1 Misdemeanor in March 2014. Wills owes $6,971.06 in restitution to a Phoenix homeowner after taking $11,400 for a remodeling project in February 2013 and then abandoning the job. Wills is known to the ROC. He was licensed from April 2006 to June 2008 but his license was revoked on July 2008 for performing poor work and abandoning projects. In total, the Agency received eight complaints against Wills while he was licensed. After being revoked in and since 2008, the Agency investigated 20 unlicensed complaints against Wills. Since his first unlicensed complaint, Wills has taken $220,195 from Arizona home and business owners, often abandoning the project after receiving a deposit. Of the 20 unlicensed complaints investigated, the Agency submitted 15 to either the appropriate County Attorney's Office or the Arizona Attorney General’s Office for prosecution. Wills pled guilty to charges of Contracting Without a License in 2013, 2014, and 2015. He also pled guilty to the charge of Fraudulent Schemes and Artifices, a Class 2 Felony, in March 2018. Most recently, on August 22, 2018, Wills pled guilty to two counts of Theft, a Class 3 Felony in a case stemming from four AZ ROC investigations from 2013 to 2016. The investigations revealed that Wills took a combined total of $143,788.80 from four Arizona homeowners who hired him for home remodels and repairs. In exchange for the nearly $150,000, the homeowners received poor work or had their projects abandoned completely. The Arizona Attorney General’s Office is prosecuting this case and sentencing is set for October 18, 2018. Wills was taken into custody at a Mesa residence without. He was transported to the Mesa Police Department's Holding Facility for processing. The AZ ROC commonly receives complaints regarding unlicensed entities exploiting property owners ranging from poor work to complete abandonment. The AZ ROC reminds property owners to ask contractors of their license status and to check the license by using our website or giving the agency a call. If any member of the public is home or property owner and believes they may be a victim in a unlicensed contracting project, they are encouraged to file a complaint with the ROC.